Thanks everyone for another great clam release! It was the 5th release in our 250,000 clam pilot restoration project. Professional clam farmer Carter Davis, as always, greeted us in Pine Island with the clams freshly harvested and ready to go. Finn, Josh, Will and Val – our stalwart loading team – were on hand and joined by Ernesto and his 2 helpers. Transferring clams from bags to baskets, and then loading the truck was super-fast and completed in record time. New partner Gold Coast Eagle Distributing donated driver Michael Welch and a Budweiser refrigerated truck, and they were fantastically helpful. Not only was the lift gate a life saver – lifting 3500 lbs of clams into the truck was a snap – but more importantly the truck was set to 75 degrees, just a few degrees cooler than the water temp the clams came out of. Minimizing time out of water and temperature changes is important to reduce stress on the animals. The clams were not stressed as evidenced by Ernesto’s observation while diving that they started burrowing as soon as they hit bottom. Happy clams = rapid burrowing = improved chances of restoration success. The Mote team has grown to include Staff Scientist & Program Manager Dr. Emily Hall and Senior Scientist Kim Hull (spotted eagle ray clam predation studies). Of course Senior Scientist & Benthic Program Manager Jim Culter and his team, who have been close partners for years, were diving and setting up experimental plots. SBW appreciates this great partnership. The Sarasota Sailing Squadron was again the perfect transfer and launch point for our Sarasota volunteers, boats and captains. We had about 33 volunteers and 7 volunteer boats – what a turnout! Kudos again to Larry Beggs and Reef Innovations for superior work barge volunteerism! Thanks to the Clam Release Newbies who joined us. 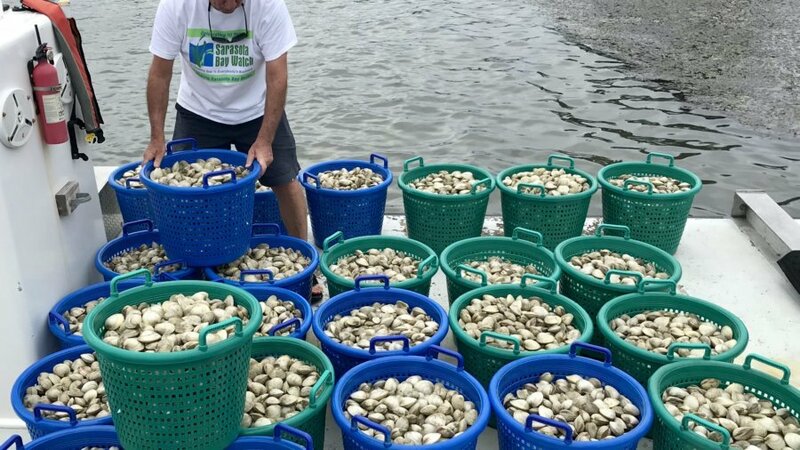 Going forward we have about 65,000 more clams to harvest, transport and release. Next release date is December 1st.